MSA Safety have now designed the PremAire Escape, which is a positive pressure, precise duration EN 402 device that offers respiratory security when emerging from toxic atmospheres. This was proposed with the extensive input from the gas and oil customers throughout the world. It has been designed especially for those who highlighted the requirement to have a respirator that will withstand the maximum level of industrial gas leak and harsh chemical environments. The PremAire Escape enables a wearer to escape without difficulty from the most hazardous environments. This gives the wearer between 10 to 15 minutes duration for a safe escape. The standard PremAire Escape is equipped with the 3S face mask. Alternatively, for a high concentration potential gas leak such as H2S, it is available with the PremAire Mask-Hood. When concentrations of industrial gases such as H2S are high, the PremAire Escape with PremAire Mask-Hood is the ideal solution. The well known 3S full face mask, millions of which have been sold, is used as the inspiration for the mask-hood design. The mask-hood boasts two separate barriers of protection. The first is the facial protection seal and the second is the hood/neck seal. The mask-hood also allows for a continuous flushing of the hood with exhaled clean air. 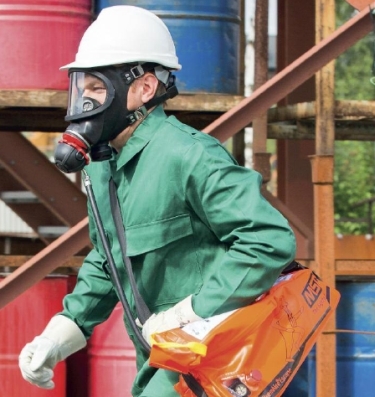 For more standard scenarios of escape, where industrial gas concentrations are under control, the PremAire Escape with 3S full face mask is the likely choice. Offering durability, comfort and safety, the 3S mask can be rapidly donned in an emergency. Lens fogging is eliminated as the inner mask is enabled for optimal air flow.